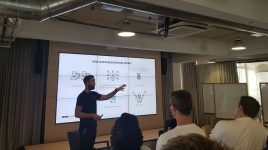 With Blockchain as a strategic focus point, Yellowtail attended the ‘Level up Blockchain course’ from Network partner Nona Creative to deepen knowledge, connect with experts and network with partners. Amongst others, the level up course included everything around coins, mining, ICOs, wallets, trading, legalities and tax consequences. Kornelis Miske who attended the course, enjoyed the pleasant atmosphere whilst meeting known and new experts and thought leaders. This really strengthened our insights on Blockchain and crypto, adding value to Yellowtail’s software propositions.